Coders like you and I sometimes look to template builders for guidance. It’s a good place to start, and Hubspot has a stellar template builder. That’s great, but it’s built on the Bootstrap 2 framework. Bootstrap, that offers features like the bootstrap menu builder, is currently on version 3 and the beta version 4 was released December 2015. 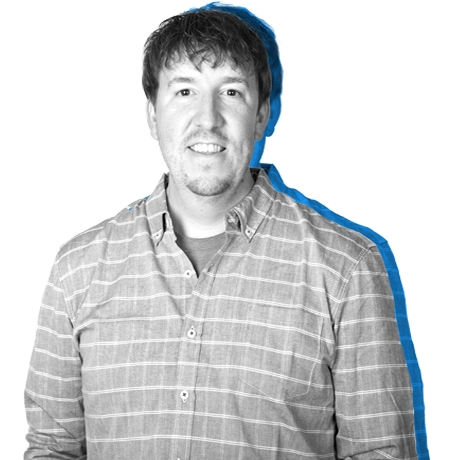 This means that the code base is a little outdated, and it may not be the best framework for your website. Let’s assume you have a static site fully built out with HTML. For this demo, I have a Home, About, Blog, and Contact Page. We’re going to be taking these files and copying them into Hubspot. For demo purposes, I’ll be using Sublime Text as my code editor and the Sublime SFTP plugin as my FTP client, but you have the ability to use any editor of your choice and upload via Hubspot’s FTP Uploader. I have a base template that follows the exact same folder structure as Hubspot. To keep things organized, I create a folder inside each folder with a template name. 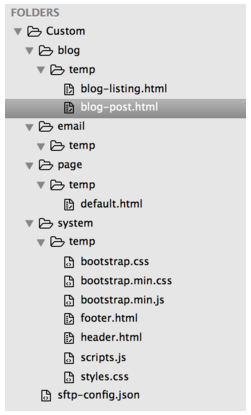 For example, inside the blog folder, I have a folder created name temp. Inside the page folder, I also have a folder named temp. This allows me to keep my projects organized. For example, a 2014 theme can be separate from your updated 2016 theme. The name temp is just an example and can be named anything you’d like. The next step is to modify our templates with HubL code. For more information on HubL, go here for documentation. Hubspot also checks your code for errors. If the code has an error, it will alert you. This ensures your code is solid. I’m going to take the header code and paste it into the header.html file located in the /system/temp/ folder. Now we have to make a few tweaks to the header.html file using HubL code. And now, let’s do something similar with the footer. I will cut everything from line 79 to the end (line 97) and paste it into the footer.html file located in the /system/temp/ folder. Now we have to make a few tweaks to the footer.html file using HubL code. Let’s first include the header and footer we just created. You can the full documentation for the Header HubL code here. You can the full documentation for the Rich Text HubL code here. 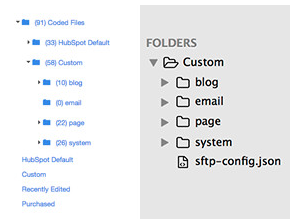 The final step is to upload your files using Hubspot’s FTP. Remember, you can use whichever FTP client you’d like, but I’ll be working with Sublime SFTP for this demo. You can find setup instructions for some popular clients here. Per their instruction for Sublime SFTP, I have my handy sftp-config.json file set up. Now I can upload my project folder to their servers and they will be ready to use. That’s it! Now that you have your basic starting template and have modified a few content pieces with HubL code to make them editable, you can run with it. You can utilize this same methodology to develop your blog listing and blog post templates as well.